This is my car - a Nissan Skyline R33 GTR V-spec. As such it has a 2.6 litre straight six twin turbo engine with 4 wheel drive and 4 wheel steering. Currently the car is in a fairly mild state of tune, developing around 480 - 490 horsepower at the flywheel (estimated, measured 420 at the wheels) at 1.15 bar of boost. Although that's not much compared to some Skylines, it's still more than most Ferraris. My aim for the car is for about 500 - 550 bhp. However, drivability (ie good engine response across the entire rev band) is important to me. Therefore, all modifications I have carried out have been chosen with this in mind. I'm not there yet (and will have to upgrade the turbos yet again to get there) but it's now coming along reasonably nicely. I'm going to enjoy it as it is for a while before embarking on any more upgrades. On a rolling road day that the previous owner attended, the car made 382 bhp, which is fairly respectable for the spec (especially as the car still had the cat fitted). The first thing to change was the air filters. While the Blitz items looked great, they perform fairly poorly as filters. They flow air well but they let too much dirt into the engine. Luckily, these filters had only been on the car for about 6000 miles so I doubt that much harm had been done. I replaced them with the Apexi filters which in tests came out top in both flow and filtration performance. It seems a shame to have to spend money on aftermarket modifications without having actually gained something in terms of performance but I saw this as an essential change for the sake of the life of the engine and turbochargers. Power wise the engine felt very disappointing at the low end of the rev range. 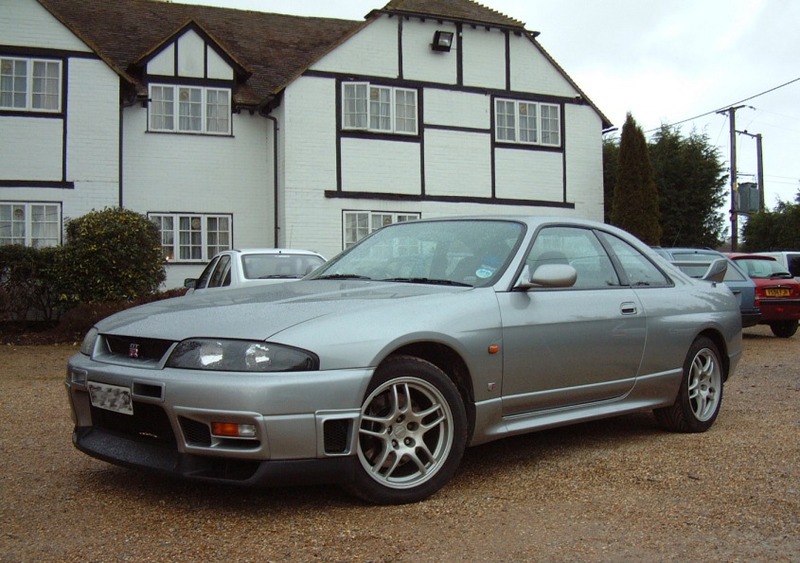 The Skyline is a big heavy car for a 2.6 litre engine so without the help of boost it felt very gutless. My previous car was a reasonably tuned 3 litre Calibra. The Calibra was about 250kg lighter and being normally aspirated, the engine had a lot of low down pull. In the Skyline, once the revs were above 3000 the turbos were beginning to do some work and once above 3500 rpm it went reasonably well. Power held well up to about 7000 rpm after which it began to drop off quite noticeably. Unfortunately, I have misplaced the torque graph of the car in this spec but if I find it I will superimpose it onto the torque curves that I already have. I discovered that the Skyline is fairly thirsty. However I drove it, I wasn't really getting any more than about 200 miles per tankful and when filling up was getting about 50 or more litres into the tank (it's got a 65 litre tank but the fuel guage is very pessimistic). However, I didn't buy a Skyline to have a cheap runabout so if you want a performance car you have to live with something a bit more thirsty than your neighbour's Metro. The result of the remapping work was an increase of 24 horsepower at the hubs (an increase of roughly 26 - 28 horsepower at the flywheel). This may not sound much for a car that was already making over 380 horsepower to begin with but a programmable engine management system is an essential for future power upgrades and more importantly, it has resulted in a stronger and flatter torque curve. Torque is improved from 3000 - 8000 rpm but the biggest gains are between 4000 and 6000 rpm. Additionally, that extra 24 horsepower at the hubs was as a result of the remap alone. I did not get an 'at the hubs' power figure for the car in the original spec (as I bought it). The first run on the dyno was with the boost controller and race cat already fitted. I decided to go for the AVC-R boost controller because it had some extra features such as the ability to map boost to revs. However, I cannot make use of this feature at the moment because common sense combined with stock turbochargers prevents me from running over 1.0 bar of boost. The Blitz NUR exhaust has a baffle plug in it so that the driver can choose between higher power or a quieter exhaust note. Abbey Motorsport mapped the FCon-S with the plug in and then seperately with the plug out. The car made about 10 ft-lb more torque with the plug out; however at the top end power wise the difference was only about 1 bhp! Because I found the noise of the exhaust with the plug out very wearing, I decided to sacrifice a bit of mid range torque in exchange for some sanity. (With the plug out, the Blitz was at its worst between 2500rpm and 4000rpm, just where you sit at most of the time - it used to resonate in the cabin and sounded awful and after a while it was starting to make some of the interior cabin trim rattle). To drive, the car definitely felt stronger in the mid range. The low end was not much changed but from about 4000rpm and up it felt noticeably stronger. Originally, the car had a very big dip in the torque curve at about 4500rpm; the remap cleared this up. Fuel consumption hasn't got any worse, which is nice, so thumbs up all round. The injector duty cycle was now peaking consistently at 92%, showing that to get any more power out of the engine I would need to upgrade the stock 444cc injectors to something larger. The Apex'i AVC-R boost controller is a funky bit of kit and tells you all sorts of handy things like this. I was expecting some fairly substantial improvements from this upgrade. Not only was I expecting to get some improved driveability but I was also hoping for an extra 40bhp or so at the wheels. Unfortunately, it turned out that I was only right on one count, not both. The driveability was indeed very much improved. On the road I was getting boost about 500rpm earlier than before and the mid range felt stronger than before (this can be clearly seen on the torque curves). The increase in low end response made driving the car so much more pleasurable and more relaxed. I found that I was not going up and down the gears as much when driving on slowish roads, and on hilly ones. The car would pull much better in the higher gears at 40 to 60 mph speeds. This made it far better as a car for the road. At the top end, power wise, there was a small improvement between 6500 and 7500rpm but nothing much to write home about. Abbey themselves were surprised by the comparatively small power increase - power (at the wheel hubs) was up from 346bhp to about 355bhp. Abbey said that they thought the exhaust may now be holding the power back. The Blitz is a great exhaust for power but isn't really designed to be used with the plug in if you want good power from it. However, as I didn't like the noise it made with the plug out, that was a non-issue. Abbey said that when the car was next in for a service, they'd try a Silent Hi-Power on it for me to see what difference it made. Interestingly, the car is noticeably more economical now. As I said before, I didn't buy this car for economy but this is nevertheless a nice surprise. I was getting about 20 - 25 miles extra per tankful. As the car was in for a major service including a cam-belt swap, I chose to have the cams upgraded at the same time and while they were at it, have a vernier pulley kit fitted at the same time so that they could be optimally set up. While the car was in, as they had promised Abbey tried an HKS Silent Hi-Power exhaust in place of the Blitz NUR to see what difference it made. I had already been in another Skyline GTR with a Silent Hi-Power and found the noise levels fine. With the new cams and exhaust, the car was making about 383 bhp at the hubs. With the new cams but the Blitz NUR with the plug in, it was not much better than before. However, with the plug out, the Blitz made 20ftlb more torque and 5bhp more power than the Silent Hi-Power. However, I had already decided that the Blitz wasn't going to be used with the plug out so I decided to switch to the Hi-Power. I asked Abbey to try the Hi-Power with a decat pipe on. After some further remapping, power was up to 403bhp at the hubs. When I drove the car home after collecting it, there was a very noticeable difference. The car was even more responsive than before. When it came on boost it came in sooner and harder. It felt far quicker than before. At the top end, it seemed to stay stronger for longer. It was much quicker than before. I was a happy bunny - the car felt great. Not only was it (guessing here) about 100 horsepower up on when I first bought the car, power was now coming in about 800rpm earlier too. This was winning all round. Fantastic stuff. Abbey did a great job here. The exhaust note from the new exhaust was great too - it was a deeper sound than the Blitz and far less intrusive and somehow 'meaner' sounding. The sound really turns heads now. Economy wise it's gone back down to doing about 200 miles per tankful. A small price to pay for the power and driveability improvements and still no worse than a standard car. I can definitely live with this. So why a twin plate clutch? Well I had a stock clutch before and 2 days before it was booked in for the 48,000 mile service and cam upgrade, it started to slip. With more torque on the way it wasn't going to get any better. On my previous car I had had a paddle clutch and hated everything about it. If it had come with a pot of Marmite I'm sure I would have hated that too, it really was a nasty clutch. It juddered and it was on/off - very harsh and very hard on the engine mounts and other bits and pieces and it even ate the flywheel. It was great for doing fast getaways but that's about all I liked about it. I asked Abbey if there was an uprated clutch available that would be as nice to use as the stock Nissan clutch. They recommended an HKS GD-Max twin plate clutch. It's not cheap if you're used to paying Ford or Vauxhall prices (almost £1700 including VAT and fitting) but it's brilliant. It feels just like a stock clutch to use but it's fine for a Skyline with up to 600 horsepower. It's nice and smooth to engage, just like the stock clutch, and the weight on the pedal is hardly any different to stock. The only downside is that it clatters when you disengage the clutch at tickover (this is normal, they all do it) but when driving along it doesn't do this. This upgrade was prompted by one of the air flow meters failing. As the F-Con Pro doesn't need them and I was considering it at some point anyway, now seemed the time to do it. Peak power is up from 403bhp at the wheels (hubs) to 420bhp at the wheels (hubs). Also, at peak power, it stays closer to peak power for longer, ie the power graph is flatter at the peak. This means that on average the car is putting far more power down to the tarmac compared to before than the 17 bhp increase would suggest. The car feels noticeably more lively from 5000rpm upwards. Before, above 7000rpm it felt like the power suddenly dropped, now it feels like it wants to rev right up to 8000rpm and still pull hard. The car is no worse in any category, except perhaps higher fuel consumption when giving it some stick but that's expected with more power isn't it? Boost now holds at 1.15 bar right up to 8000rpm whereas before it was dropping to about 1.07/1.08 bar at 8000rpm. I expect this has a large part to play in the peak power increase but the improvement from 5000 - 6000 rpm (where at one point it gained nearly 40 ft-lb of torque) is I think down to having a more capable engine management system allowing the engine to be mapped more optimally. NOTE: at all times the car has been mapped for 97 RON fuel. While at the time more power couls have been gained from running and mapping on Shell Optimax (98.6 RON when fresh) I could not easily get it in my area and it seemed to be foolish to have the car mapped on it just to gain a few extra horses on the dyno sheet only to find that I later blow it up when running on my more regular stuff. Here you can see how the torque (and driveability) has improved with each modification. You can see that currently the turbos are producing full boost about 700rpm earlier than they were with the car at Setup A. On the road, boost actually comes in a lot earlier than this - I get 0.45 bar at 2000rpm in high gears. Setup B: as Setup A plus: R34 GTR turbos, HKS hard pipe kit, Apex'i GT intercooler, HKS high flow turbo elbows, 600cc injectors, boost now 1.1 bar. Setup D: as Setup C instead: HKS F-Con Pro ECU instead of F-Con S ECU and air flow meters removed (F-Con Pro doesn't use them). NO OTHER CHANGES, SAME BOOST. I'm not going to try a top speed run in the UK because I'm not prepared to do it on a public road and there aren't many airstrips long enough. 0 - 60 mph and quarter mile times are too dependant on driver skill (which I don't have when it comes to quick launches) but these tests below give a rough indication of the car's performance and engine flexibility. A good driver could probably get the car to do 0 to 60mph in about 4 seconds dead, maybe a shade less, but I'm not about to try it. * - starting at a steady 40mph off boost in the gear under test, then flooring the throttle. The times should give an indication of the driveablility considering that it's not a big power Skyline with over 700 horsepower. Ambient temperature approx 6C during tests. 3rd is the optimal gear for 40 to 100mph runs - 4th gear still has almost 2500rpm left to go by the time the car reaches 100mph. Top gear roll on video (1.5MB) to demonstrate the low down response - view of boost controller showing readouts of boost, rpm and percent throttle. It's quite blurry and shaky but if you keep pausing it you can see that I got 0.5 bar by 2000rpm and 1.0 bar by 2400rpm - quite respectable considering it hasn't been bored or stroked. Max boost is set to 1.15 bar, which it reached by 2500rpm. Ignore the first few seconds, I had just changed up into 5th so the rpm indicator shows higher revs to begin with. I may well try to mount the camera on something to try to get a clearer image and then repeat the run rather than having to rely on someone holding it for me. Not entirely sure yet. I'm about 60 horsepower down on my initial goal but I am so enjoying the excellent low down response that I don't want to spoil it. I think the only way to keep the good response down low while getting another 60 horsepower is a 2.8 kit, some mild head work and some slightly bigger turbos. Very costly, that. Not yet decided whether it's worth it considering that I've not yet mastered the art of printing counterfeit bank notes. I get quite a lot of visitors to this page so it would be nice to know whether people find it useful. Also, if there's anything else you'd like to see on here then please let me know. Alternatively, if you just want to tell me how much you like small buttons then go for it. You don't have to give me your name or email address if you don't want to ... however, if you want a reply then I'll need something to go on. It won't be published, forwarded or in any other way printed on the side of a cat, sold to a small group of tropical pigmies or recited ad nauseam to a drunken epileptic in Kidderminster. I hate spam as much as most people and won't do anything to increase the level of yours.